It's an opportunity to personalize your cruise vacation going where you want, traveling as you choose, to see and do the things most important to you. It's the stuff that memories are made of. Hiring a taxi next to the ship? Excellent, detailed description of the tour on the cruise line's website with the minute-by-minute itinerary, photos, videos, etc. Cruise lines try to quantify ease/difficulty of walking, but these words have different meanings to different people. It's easy to book the ship's tour before or during the cruise. However, many cruise lines now require full payment of the tour when you book it and specify limits on time when you can cancel the tour to get a full refund. By comparison, there are many private shore excursion tour companies where you can book a tour that is "lower cost" and "better" than the ship's bus tour "without need to pre-pay for the tour". It maximizes shore excursion time. You'll get priority disembarkation to board the bus parked next to the ship. If it's a tender port and you are on an all day tour, you'll get priority on the tenders to maximize time available for your bus tour. It's a good choice when public transit from the port to the tourist site involves time-consuming, multiple bus & train connections. Example: Public transit from Livorno port to Florence Italy involves a complex, time-consuming, combination of bus and train connections that arrive on the wrong side of Florence. The ship's "Florence Italy on Your Own Bus Tour" is the fastest travel method to the main Florence tourist sites. This maximizes free time for my walking tour in Florence and guarantees the ship won't leave without me. The alternative public bus/train travel poses risk that I might miss a connection and get back to the port late. When crime or civil unrest is a concern, take the ship's tour buse. The bus is in contact with security and local police. On one tour, our driver was warned of a spontaneous demonstration the city. Police directed him to use a different pick up point for passengers. Our tour guide took us to the new bus stop. The driver used a different route to the ship and was in phone contact with ship security during the drive. We avoided a potential problem that we may not have avoided had we been on public transit. It "sounds nice", but it's usually not a compelling reason for me to use the ship's excursion tour. My risk of not getting back to the ship on time is greatest when I'm on an all-day tour. I do not use public transit on all-day tours if it requires multiple connections between buses and/or trains because I might miss a connection and get back to the port late. I use local, professional driver/guides on bus, van, and car tours. They know the area, traffic conditions, roads that are under repair, etc. and have an excellent track record of getting passengers back to the ship on time. I rent cars with a GPS for all-day tours. My GPS is programmed with coordinates for the dock. I frequently check the time it will take to get back to the ship and use that information to know when to turn around and head back to the port. To the extent possible, I go to the tourist site furthest from the ship first. Then I visit tourist sites along the return route, and spend my remaining time at tourist sites close to the ship. I'm usually close to the ship late in the day. The schedule is fixed/rigid. If the schedule has a 45 minute stop at a fort and it is raining, you'll spend 45 minutes walking in the rain or seeking shelter in the museum at the fort. Sometimes the tour guide stays at a shop to maximize the "kickback" on purchases by cruise ship passengers. On the ship's bus tour from Rhodes Greece to the Acropolis, the bus stops at a ceramics shop that has gorgeous hand-crafted products. The problem is that the tour guide gets a "kickback" on purchases and will stay at that shop for a long time. We spent so much time at the ceramics shop that we had very little time at the Acropolis. I was not happy. It's a bus! The ship's bus has ALL the disadvantages of a bus tour. Because of its size, a bus is restricted on where it can load/unload passengers and where it can park. It's often a long walk (1 to 2 miles round trip) from the bus parking lot to the tourist sites. Buses cannot park next to churches, monasteries, castles, etc. that are often at the top of hills. The bus parking lot is always at the bottom of the hill. I have to walk up/down hills to visit the tourist sites. The bus can't stop for lunch at the small, family owned restaurants known for an excellent atmosphere, great food, and service. Buses stop for lunch at larger restaurants which are often crowded because multiple buses are at the same restaurant. Sometimes, the restaurant is more like a school cafeteria than a quiet, intimate setting. Lunch with a group from a bus usually takes longer than for a small group of people in a van. The bus rarely stops for photos because it takes 20 minutes for people to get off and back on the bus. A toilet stop on a bus wastes 20 minutes or longer! I can't take pictures from a bus due to reflections in the glass because the lady in front of me is wearing a white sweater. NOTE to women on bus tours: Please wear all black clothes so you don't create reflections on the bus windows. Whereas NO planning is required for the ship's bus tour, you have to do some planning to use an alternative bus tour. Determine which bus companies are available, check customer ratings, determine where the bus will be parked at the port, and book your tour. You do not need to organize a group, you are just buying seats/person on the bus. In Athens, and in Katakolon, Greece, I took the ship's bus tour on my first visit. On my second visit to these ports, I used a competing bus tour by Katakolon-Express. At these two ports, the Katakolon-Express bus picked us up next to our ship. The tours by Katakolon-Express were actually better than the ship's bus tour at half the price. About half the price of the ship's bus tour. The itinerary might be changed if people on the bus agree and request a change. Unlike the ship's bus that doesn't make any stops along the road to Katakolon, Greece, our guide on the Katakolon-Express asked if we wanted to make two additional stops. We agreed. One stop was at the town near Olympia. The other was at a luxury, resort hotel with gorgeous views of the coast from the patio as we enjoyed a libation. I was impressed! 1) The official tourism website for the port area usually lists bus, and other tour companies. TripAdvisor is packed with information about tourist sites and tour operators. You'll find tour companies that take small groups, cab companies that specialize in private tours, bus companies where you can join a private tour by paying for your seat on the bus, HopOn buses in the city, etc. TripAdvisor has customer reviews and ratings of tour companies. This is helpful to narrow your search. Be sure to get details on exactly where the bus will be parked at the port. Ask them to send you a map showing the location of their bus and the ship's dock. Determine when you are charged for the tour and the rules for cancellation and refunds. The Cruise Critic Roll Call has a blog for the cruise ship itinerary/date you are sailing. This can be an incredibly useful source of information. It's an opportunity to compare notes on planning shore excursions, make new friends, and renew acquaintances with old friends. See if anyone on your roll call is planning a bus excursion and ask if other travelers have had experience with bus tours. In Cork-Cobh Ireland, many of my friends took bus tours that were the same as the ship's excursion at half the cost. There are several bus companies in Ireland that cater to the cruise industry. See my port guide for Cork-Cobh Ireland. On the Cruise Critic Roll Call for our cruise to Greece, we met Raymond Ma. He had booked tours with Katakolon-Express and volunteered to make reservations for others. Eventually, he got 70 passengers and booked two buses with Katakolon-Express for tours of Athens and Katakolon, Greece. See my Katakolon (Olympia) Port Guide for details. Why/when do I take the ship's bus tour vs. a pre-arranged private tour? If I just want transportation from the ship to one tourist site, the ship's bus is often the fastest, easiest travel option vs. public transportation that involves multiple, time consuming bus and train connections. I always take the ship's "Florence on your own" bus tour from Livorno port to Florence Italy. If I don't know anything about the port and don't have time to research and schedule other types of tours, the ship's bus tour is my only choice. However, if I have time to research tour companies and book a tour, my first choice is a pre-arranged private tour in a van or car. Unlike the ship's bus tour, a private tour is highly personal and focused on my interests and priorities. The private tour is not held captive to a rigid schedule. The schedule can and will be changed to best meet my interests. It's not a bus and is not limited to parking lots for buses. It's a van or car that can stop anywhere and park wherever there is space. See the map below. NOTE: Private tours have to be booked six months or more before the cruise because the best tour guides are in high demand! It's a personal, flexible tour. The itinerary can and will be changed to best meet our interests. The driver will stop for photos wherever we wish to stop. We asked the driver to change our itinerary and stop at Pisa so we could take some photos. He parked the van next to the Leaning Tower! WOW! We took photos, bought soda at a cafe, and made a pit stop. 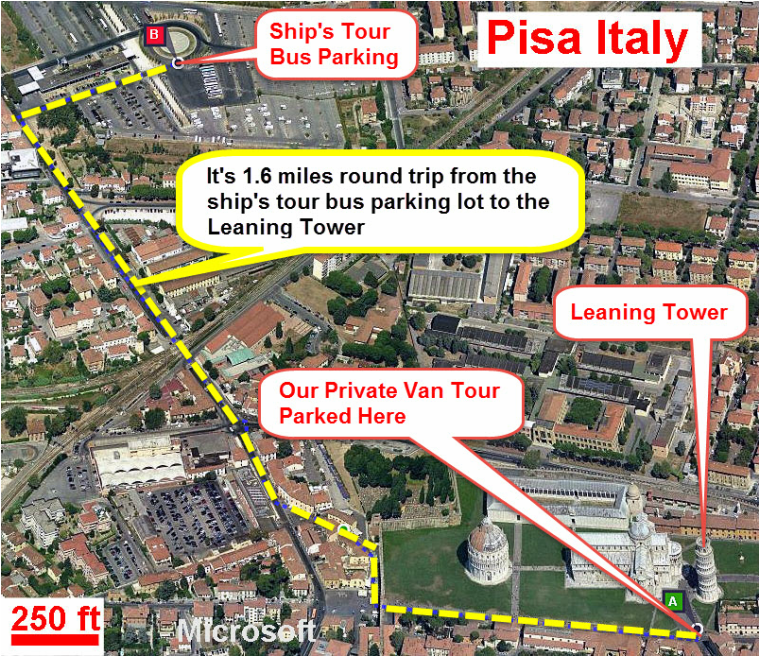 The map below shows the Leaning Tower of Pisa. Note the location of the Ship's Tour Bus Parking lot. It's a 1.6 mile walk round trip to the Leaning Tower. You can avoid walking by using a tractor pulled train (for a fee). Note that our Private Van Tour parked next to the Leaning Tower. On a bus tour, it's common to have to walk a mile or two round trip from the bus parking lot to the tourist site. Those miles add up on a tour that visits several sites. Many churches, castles, and monasteries are on top of hills. The bus parks at the bottom of the hill. Our van parks next to the church at the top of the hill. When I'm on a bus tour, I waste a lot of time and energy getting to the tourist sites. A van/car tour is more time efficient and less stressful. If you are mobility challenged, extra walking and climbing up hills can be a big deal. We asked our driver to stop at a restaurant for lunch. He took us to a family owned restaurant in the beautiful Italian countryside. The driver suggested we let him order for us. We agreed. The food, wine, and views of the countryside were fantastic. A private tour in a van has many advantages over a bus tour. My private tours are often unforgettable tours - "the stuff that memories are made of". Someone has to research and select a tour company, plan, and organize the tour. The person organizing the tour has to find people to share the cost of the tour. People who commit to join the tour MUST honor their commitment and pay their share. If you want to cancel, you have to find a substitute to take your place or pay your share. We were on a private tour with six people in a van. At the last minute, two people canceled. The rest of us had to cover the $ shortfall. Ugh! People on the tour need to 1) meet on the ship so they can recognize one another, 2) have a meeting point/time on the ship to disembark together, and 3) know where the van will be parked at the dock. Private tours involve a commitment as specified by the tour company. It's difficult to cancel at the last minute without some financial obligation. Know what that obligation is. Your commitment is usually your share of the tour cost. Check the official tourism website and TripAdvisor for names and reviews of tour companies. Visit the Cruise Critic Roll Call for your ship/itinerary. People who have researched and booked a private tour will post a description of the tour and cost per person. This is an excellent way to find and join private tours or schedule your own private tour and invite other members on the Cruise Critic Roll Call to join you. A rental car gives me the ultimate flexibility to go where I want, stop for photos, and spend time as I choose. I always rent a car in Charlottetown PEI Canada and Sydney, Nova Scotia Canada. If our ship docks in Quebec City overnight, I rent a car and park it next to the ship so I can use it the next morning. Everyone has a comfortable, window seat. You can take good photos from inside the car - just pull over and open the windows or step outside the car. Cost is low, especially if the rental is shared by four people. In Saint John, New Brunswick, Canada cost was ~ $ 35/person for a rental car tour to St Martin Sea Caves and several other sites. The comparable ship's bus tour was ~ $ 100/person. It takes a lot of time/work to plan my driving tour. I plan the driving route to the sites I will visit with maps and GPS coordinates. I know exactly where I will be going and how to get there. I have GPS coordinates for parking lots so I can park and explore the area on foot. I also create walking tour maps for the towns. The rental agency may be a long way from the ship. I waste time and might need a taxi to/from the rental center. I do not rent cars when the driving routes involve large, crowded cities, roads that are poorly marked, and/or areas where I do not have accurate, GPS coordinates for the route. As I drive, I note delays due to traffic, road construction etc., and adjust my schedule accordingly. If there is road construction, I will encounter it outbound and can factor it into the time to return to port. I program the GPS with coordinates for the rental office so I can easily check return time while I am driving. This helps me decide when to turn around and head back to the port. Use Google Maps to find car rental/hire companies. Google recognizes the word "near" in the search string. Search Google, or Google Maps, for "Car rental near XXXX" where XXXX is a street address or the name of the port city. Go to the corporate website for your preferred car rental company and look up the addresses of the rental offices near the port. The corporate car rental website is always up to date. It is the ONLY reliable source for location, phone number, and contact information. Google is NOT up to date on car rental locations because rental offices tend to relocate often. I ALWAYS contact the local rental office where I will pick up the car. The people at the 800 corporate phone number do NOT know whether/how the local rental offices arranges to pick up people from a cruise ship. Contact the LOCAL RENTAL OFFICE via email or phone to ask what the options, time, and cost are to get from the ship to the rental office. If they offer a shuttle service to/from the cruise ship dock, ask how you arrange to be picked up (some require that you call them for pickup). Check hours of operation for the shuttle and where it picks you near the ship. If they do not have a shuttle, ask for the name and phone number of taxi service and approximate cost for a taxi from the ship to the rental office. Rental Office Open Hours: Most rentals have shorter hours on Saturday and are closed on Sunday. Rentals at the local airport are usually open seven days a week, but the airport might be a long distance from the cruise port. Check age restrictions for car rentals. In Ireland, the government defines age restrictions for rental car drivers. However, the insurance carrier for the car rental company often imposes tighter limits on the age restrictions. The age restriction information should be posted on the rental agency website. Know whether you are "reserving" a car, or "booking" a car. Some rental websites do not reserve cars, they book cars and charge your credit card a non-refundable fee. Avoid waiting 30-45 minutes in line behind all the cruise ship passengers getting cars. Avis, and some other car rentals, have a "Wizard" system. You enter all your preferences for car rental for your account on their website. This eliminates need to fill out paperwork when you pick up the car. To pick up the car, you show your driver's license, sign the contract, and get the keys. This can save you a lot of time when picking up the car. Insurance - If you are involved in an accident, the car is taken out of service until it is repaired. Rental companies may hold you liable for the days of service they cannot rent the car. ALWAYS get an insurance rider to protect you from huge $ fees to cover potential "loss of service" days for the rental car involved in an accident. Liberty Mutual, my car insurance company tells me that their policies cover me for accidents/injuries but NOT "loss of service" on a rental car involved in an accident. Whether or not you are planning on a HopOn bus tour, be sure to visit the HopOn bus websites to find a free, highly legible map that shows all the major tourist sites in the city. Unfortunately, many of the HopOn bus companies no longer publish "quality, highly legible maps on their websites." The map at left is a section of their copyrighted map of the City-Sightseeing HopOn bus tour of Barcelona, Spain. The map and brochures describing the three bus routes and all the tourist sites can be downloaded as high quality pdf files. Note this map shows the cruise ship terminals A, B, C, and D.
$ 32.50 per person. That's a bargain! Whether or not you use a taxi is a personal choice. I use taxis at the port for short rides to nearby tourist sites in the city. Sometimes, a taxi is a good option to explore the city. The question is whether or not a taxi at the port is a good choice for an all-day 6-9 hour tour traveling a long distance from the port. Some of my friends are willing to "take a chance on a taxi tour from any port." That's a bit risky for me because I don't know anything about the taxi company, their credentials, or reputation. I've used taxi tours with good results in the Caribbean Islands, but I would be reluctant to tour this way in Europe. When I am touring in Europe, I want the best, most knowledgeable, professional driver/guide because I want more than just transportation. I want a tour guide/driver with intimate knowledge of sites, restaurants, etc. to personalize my tour for my priorities. All day taxi tours in Europe are not cheap, so I always go with the best driver/guide. Each port is different, but there are many ports where you can explore the area on foot using some public transportation. I include this information in my port guides. Generally, walking and public transit is the lowest cost way to tour the port area.